Cheynie had a vet visit today for her yearly wellness check and two vaccinations. What a pleasant surprise! She was much better-behaved both in the car (no singing) and at the vet's office than she has ever been before. She was happy and friendly in the waiting area and sat next to me even while a lab there was barking his head off at her. She didn't see her regular vet today but saw his associate. Other than a little nervousness, she was fine being handled, lifted up onto the steel exam table (a first for her) by a big, burly guy she never met, didn't flinch for her shots nor at all no matter where she was poked or probed. I was very proud of her. Imagine my surprise when the vet asked if she was always "like this" and "strongly recommended" professional obedience training for her. I didn't know whether to laugh or sock him in the nose! She needs to go back in three weeks for the remainder of her shots but I think we will request to see her regular vet or allow a vet nurse to administer them. "Aww, I'm not that scared"
Last edited by JGLI; 10-02-2014 at 06:17 PM.. So what made him suggest the training? I think because she was a little nervous with four new people bustling over her in a very small room. They were all brand new to her and they didn't spend any time 'greeting' her or taking time to get to know her first. She loves people and is extremely friendly but you have to give her a minute or two to check you out before she is completely at ease with you. That didn't happen. That... and the business cards "just happened" to be so handy. I think Cheynie deserves a treat for being so good. Question....Why did it take 4 people for the exam and shots? When Dunny has his checkup and shots the vet does it all. Also, since there are 4 vets at the clinic, whoever takes your folder, leads you and your dog into the room and makes friends with your dog before proceeding. Finally, the vet must be related to or friends with or getting a commission from the trainer. Think you would have gotten a card no matter how Cheynie acted. I would have wanted to sock the vet in the nose. The question you asked was right in the front of my mind too. Ordinarily, a vet assistant meets you in the waiting area and escorts you and your pet to an exam room, takes some basic information, takes your pet to be weighed, and spends some time chatting. That did happen today. She left and the vet came in.. so there were two of us. The large man came in right after and just lifted Cheynie up onto the table. Her regular vet gets down on the floor and talks to Cheynie before examining her and it is usually just the two of us and Cheynie (Chessie before her). I think being snatched up and placed on the table by this strange man surprised me as much as it did Cheynie. While looking at her and her records, he reviewed her vaccination history and said she wasn't spayed "right?" and I said no, she was spayed. He did not seem pleased that it was not done at this office. I explained that I had had a lengthy conversation with Chessie's oncologist at LIVS prior to making the decision when and where to have the spay done and that I agreed with and followed the oncologist's recommendation. This vet told me he disagreed, fine but I am the one watching out for Cheynie's best interests. During this, another assistant appeared at the doorway and came in so now there were four of us in the very small room and Cheynie was still being held in the burly man's arms on the table the whole time. Actually, I was surprised at her patience. She wasn't abnormally squirmy or worked up and this wasn't the usual procedure she has been through there. Don't understand why he disagreed with Cheynie being spayed. Sadly, we learned the lesson too late with our Rosie. If we ever have another female dog, she will definitely be spayed as early as medically possible. Oh, he didn't disagree with her being spayed. He disagreed with the timing of when it was done and he would have preferred that I had it done at his practice. He is an advocate of early spay. I am an advocate of spay but current research is re-thinking the age of the dog as to when to do the spay. Early spay (6mos and under) reduces the risk of mammary cancer to almost zero, however, there is also research that links spaying at less than a year of age with an increased risk of developing osteosarcoma. I lost my Sam to mammary cancer-she was never spayed. I lost Chessie to osa-she was spayed at 6 months of age. In light of this, I very much wanted input from Chessie's oncologist as to when he felt was the optimal age for spay to reduce risks of both these diseases as much as possible. The oncologist advised waiting until she was close to a year of age which would allow her no more than one heat cycle and yet be as close to a full year of age as possible. Sound like she behaved very well. Doesn't sound like the vet had anything to complain about. 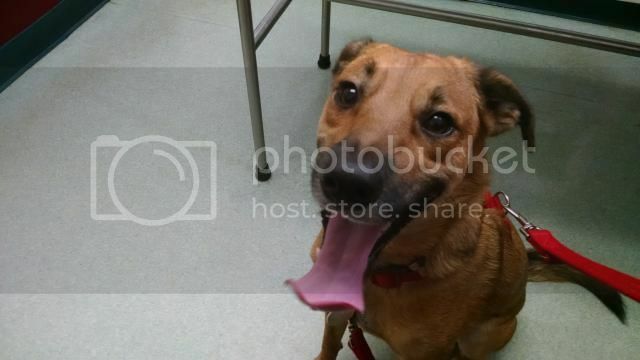 When I had Kiska in to have her teeth looked at I did not get the Vet I booked with and the one that saw her thought I should get her shots again as I had not had them on at their place. She is 8 years old so I don't intend to give her any more shots. He said, well at least she is spayed so that is taken care of. "The oncologist advised waiting until she was close to a year of age which would allow her no more than one heat cycle and yet be as close to a full year of age as possible." Thanks. Glad to know this, as if we do ever get Dunbar a puppy, it would be a female. Janice Iam glad Cheynie passed with good results and she behaved her self she did deserve a treat for being good What was this other vet thinking of?! I think it's him that needs the training LOL!! And it's understandable that Cheynie needed a few mins to settle down with a new person she hadn't seen before I would next time try and see your regular vet!!! !